Oh God! Oh Montreal! Oh Potholes! It’s pothole time again! Especially here in Montreal. Yesterday on CJAD I heard them talking about what will happen when the ice thaws. Potholes galore! What’s your experience of potholes in your area? I remember when Neil and I were bicycling along the Lachine canal, Neil’s bike hit an invisible pothole and he ended up breaking an ankle. It didn’t stop us biking but it did slow us down for a few days. Oh the joys of spring! Click below to see the tribute video that was prepared for Neil’s 80th birthday back in 2004. Click below to hear the Montreal cartoonist Aislin talk with Neil and the callers on Exchange. Terry Mosher (Aislin) discusses how he gets his ideas and reaction to recent cartoons about the pope. The morning of Wednes­day, February 21, 1973, was cold and clear in Mont­real. Shortly before 9:30, taxi driver Marcel Belisle, 36, was cruising down St. Urbain Street, keeping a sharp eye out for cus­tomers. At the corner of Duluth Avenue, he noticed a tractor-trailer moving alongside of him. Paying no atten­tion, he drove as far as St. Cuthbert Street, only to find the huge vehicle abreast of him again, this time blocking his view on the left. He glanced up at its cab — and couldn’t believe his eyes. There was no driver! Belisle sped ahead of the phan­tom truck, stopped his car in the middle of the road, and leaped behind the wheel of the enormous vehicle as it passed. To his horror, Belisle discovered that he couldn’t stop the truck. The air brakes wouldn’t work, neither would the emergency brake. Fran­tically he tried to switch the gears into neutral; they were stuck in drive. He turned off the ignition. 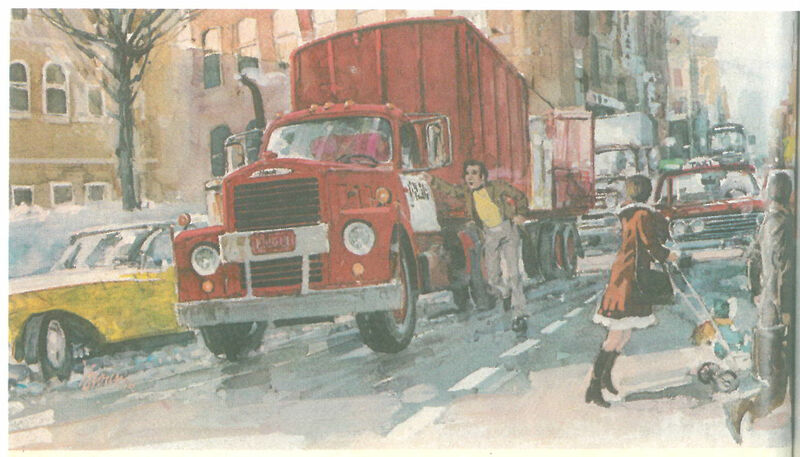 But the huge truck, 48 tons with its load of 31 crates of mirrors, con­tinued to lumber down the gently sloping street. Suddenly the slope was steeper; now Belisle was rolling along be­tween 40 and 50 miles an hour. Desperately he swung the vehicle as hard as he could onto a rapidly emptying patch of sidewalk beside Hotel-Dieu Hospital, scraping the thick stone wall of the ancient building. Still the truck was moving, bear­ing down on the next cross street, busy Pine Avenue. The street was full of traffic: men, women, chil­dren, and cars. Noticing that the light was green, Belisle had but one thought: I’ve got to get across before the light changes. Uprooting a lamp post on its unstoppable dash, the truck shot across the intersection the instant the light changed. As it sped on toward the heart of the city, Belisle realized there was only one hope of stopping it before somebody was killed: he had to cut its speed and find a level place where he could turn in. Like a hockey player throwing body checks, the big vehicle slammed into a car, damaging it badly. It then hit a large supermarket truck, forcing it into another car. Still unable to stop, the runaway mas­todon, its front already twisted into a heap of scrap, hit a fourth, then a fifth car. Finally, having managed to cut his speed in half by these maneuvers, Belisle spotted a park­ing lot on the other side of Pine Avenue. He turned sharply to the right and headed for an empty area behind the lots chain link fence. Just as he was crunching to a halt on the parking-lot fence, he turned over yet another car, bringing the number of vehicles damaged to a total of six. Truck driver Roland Levesque, who had observed the drama and had been following Belisle’s erratic course in his own vehicle, was the first to reach him. Despite fears that the vehicle would catch fire, he tore open the right-hand door and found the brave cabbie wedged between the seat and the wheel. Belisle was conscious — but bleed­ing profusely. Indeed, as he lay on a stretcher in the parking lot, Belisle had his first chance to think about what he had done. He had reacted instinc­tively. He hadn’t even wondered why the truck was moving without a driver. He had just thought of getting aboard and stopping it. Now he heard voices around him talking about it. The truck, a 1965 Mack, had been parked in front of the White Mirror and Glass Com­pany on St. Urbain Street. The driver had left the motor running while making a delivery. He had put the emergency brake on, but it had apparently failed. Belisle was taken to Hotel-Dieu, where he was found to have a frac­tured pelvis and wounds requiring twelve stitches on the thumb of his right hand, eight above the left eye, and two at the corner of his mouth, and to have lost two teeth. Shortly after his admittance, two police­men arrived and proceeded to draw up a report against him. He was actually accused of having stolen the truck! Resting later in a private room, he realized that it was 1:30 and he had not yet phoned his wife. He was in the habit of calling her four or five times a day, for Joce- lyne Belisle, at 33, was doubly handicapped: she had heart trou­ble, and had lost a leg following an accident. 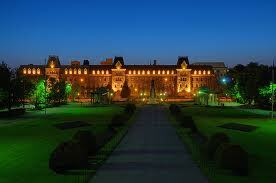 “Tm coming home, Jocelyne,” he promised. When he hung up, Marcel de­cided to go home although he had not yet had the blood transfusion that the doctors had ordered. With his good left hand he slipped his shirt on, then his bloodstained sweater and pants, and finally his shoes, which he couldn’t lace, and his boots. Only one nurse, who tried in vain to stop him, saw him as he dragged himself along a corridor to the front door. But as he walked out the door and made his way painfully down the steps, he was surprised by sev­eral people who had been waiting for a chance to congratulate him. He smiled, accepted their greetings, and moved as quickly as he could to his taxicab, which the police had brought to the hospital’s parking lot. Dog-tired and aching, he man­aged to drive 15 miles to his home in Laval, where his wife and their two daughters, Joanne and Chantal, were waiting for him. When an insurance representa­tive did come to Belisle, it was to tell him that “he had no business getting mixed up in this; the truck would have stopped on its own” However, the agent offered Belisle $500, as compensation for his trouble. Because of his money problems, the newspapers kept up their inter­est in Belisle’s story. The insurance company decided to raise its offer to $2300. But that would be it. “Take it or leave it,” the cabbie was told. The alternative was the costly business of going to court, and the outcome would be doubtful. An in­vestigation had revealed some de­fects in the truck, but none so serious that the owners would have been required to take it off the road; there was no question of criminal negligence. Ironically, Belisle was told that if he had been hit by the truck instead of leaping into it to try to stop it, he might have had a claim against them. Since the in­surer was now offering enough money to tide him over for the mo­ment, he decided to take it and sign a release. Happily, the lack of generosity on the part of those who benefited from Belisle’s courageous act was partly offset by public concern about him. Many individuals were moved and sent him donations of $2, $5 or $10. The total came to nearly $300. Deeply appreciative, Belisle nevertheless felt despon­dent. He had always been able to support his family. In another newspaper interview, a month after the accident, Belisle expressed his gratitude and an­nounced that he was able to resume his job and life was normal again. But it wasn’t so. Five months of treatment and convalescence lay ahead before he could take to the road again. And during those months he wasn’t eligible for unem­ployment insurance, nor could he get workmens compensation — be­cause his exploit in stopping the truck had nothing to do with his work. The only solution was to go into debt. And he did, in order to pro­vide for his family and meet the mortgage payments until he was working again. When he finally did get back behind the wheel of his cab in August 1973, he worked relent­lessly for 1 5 hours a day, seven days a week, to try to keep himself afloat. He was unable, however, to make much of a dent in his debts which, with interest, now totaled some $7000. Many months went by before Marcel Belisle was in the newspa­pers again. It happened on Decem­ber 13, 1974, when he went to Ottawa to receive the Star of Cour­age from Governor-General Jules Leger. The citation, read during an imposing investiture ceremony, spoke of “an act of conspicuous courage performed in circumstances of great peril.” From now on, Marcel Belisle had the right to add the letters S.C. after his sig­nature. The awards continued. In 1976 the Montreal Citizenship Council, representing 64 associations, honor­ed him with its title of Outstanding Citizen. On May 15, accompanied by his family, he was honored at an official dinner in the Mount Royal Chalet, where 600 invited guests gave him a standing ovation. Troubles he had. But among those stirred by the occasion was radio commentator Neil McKenty of station CJAD, who thought so­ciety owed a debt to Belisle that it had not repaid. Determined to re­lieve Belisle once and for all of the financial problems he had incurred by stopping the truck and injur­ing himself, McKenty launched a broadcast appeal for $7000—a sum that would enable Belisle to get out of debt and lead a reasonably nor­mal life. On the evening of Monday, May 17, hundreds of listeners respond­ed generously to McKenty s special broadcast. In the space of three hours, $10,000 was subscribed. For the next three weeks, checks kept coming in to the radio sta­tion, reaching a total of $11,700. Belisle caught the broadcast when he stopped in at his neigh­borhood garage. He immediately called Jocelyne to tell her the news, but she had already been notified by the station and seemed quite overcome. Worried about her heart condition, Marcel hurried home and drove her to the hospital. While waiting in the emergency depart­ment, he called CJAD to inform McKenty of the poignant turn of events and to thank the listeners, jocelyne recovered and together, their financial burdens somewhat lightened, they operate a small grocery next door to their home. Marcel also continues to drive his cab, while seeking a different job which would allow him to spend more time with his family. Marcel’s ordeal will pay off ulti­mately in better protection for other good Samaritans. His case spurred the Montreal Citizenship Council to present a report to the Quebec justice department advocating the indemnification of persons injured in the execution of heroic deeds, in the same way that victims of crimi­nal acts are compensated. Such protection is already law in most European countries, as well as the provinces of Nova Scotia, New­foundland and Alberta. “What would you have done if you had seen all those people in danger?” he asked her. “I’d have run to help them,” she sobbed. “That’s what I did,” he explained simply. Click below to hear how Neil started the fund-raising on CJAD. SHOULD WE HAVE DRUG INJECTION SITES? Montreal’s municipal gvernment has given conditional support to the city getting its first drug-injection site — a clean well-lighted place inside of which drug users could shoot up cocaine, heroin or anything else, with a nurse on hand to supervise. Indeed city hall wants three such sites plus a large van that could travel around the city offering the same service to a less mobile clientele. The experience of North America’s first such site in Vancouver showed that such sites could prevent overdose deaths, avert the spread of disease from dirty needles and assist the entry of addicts into detox programs. As of now about 70 Montrealers a year die from overdoses and injection-transmitted diseases such as HIV and hepatitis C so the sooner these sites are up and running the sooner lives will be saved. Still, there is opposition to these plans. Would you want such a drug injection site in your neighborhood? Such a site could attract people with mental health problems, beggars and sellers of drugs. One suggestion is to put such sites inside CLSCs and hospitals. But would the addicts go to these institutions? Would you agree to a drug injection site in your neighborhood. Should we have drug injection sites to save lives? SHOULD THE ABUSERS BE NAMED? After decades of denying and covering up widespread sexual abuse by its members at College Notre Dame in Montreal, the private school and its religious owners, the Brothers of the Holy Cross, agreed yesterday to pay their victims $18 million – the largest payout ever in Canada by a religious order. Ironically, the perpetrators who are still alive are not in prison, they reside in the Order’s luxurious retirement home in Laval. So far as I know no restrictions on their movements. Rene Cornellier, the father of one of the victims, thinks the punishment is not severe enough. His son, Rene Jr., before his death of Aids, tried in vain to convince the school authorities to put an end to the system of abuse. They did not now. Now the angry and embittered father is demanding that the names of the abusing brothers be publicly made known. Should the abusers names be made public? What do you thin k? Do share your favourite restaurants with us. Some day we may be in your neck of the woods and will be looking for aa good place to eat. I will divide my three favourites into breakfast, lunch and dinner. For breakfast you can’t go wrong with Beauty’s (established in 1942) and located on Mount Royal Ave. in the Plateau. Catharine and I often go there early Saturday morning. We have fresh chilled orange juice, a stack of blueberry pancakes smothered in maple syrup accompanied by crisp crisp bacon, all washed down by gallons of rich black coffee. Often there is a line-up but that is samll price to pay for Beauty’s. For lunch or brunch we head out to St. Jaques in Notre Dame de Grace to Cora’s. Cora is a French-Canadian entrepreneur who from a single site has built a chain of restaurants across Quebec and across Canada. We tuck into onion soup and fresh fruit with custard. YUm, Yum. For dinner we fetch up aat the famous Schwartz’s (a.k.a. 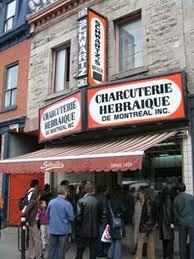 the Hebrew Delicatessan) on St. Laurent Boulevard just around the corner from Beauty’s. Another line-up here. When we get into the restaurant that goes back to 1928 (and does not take credit cards) we seat cheek by jowel with a group that resembles the inside of a Montreal bus and sprinkled with some gaily dressed tourists. My regular here is a medium-rare Rib Eye steak, sizzling between crisp French fries and a gargantuan sour pickle. This is the real McCoy. Tell us about your three favourite restaurants. We’ll tuck them away for the future. SHOULD THEY GIVE WINE TO ALCOHOLICS? A homeless shelter for alcoholics in Ottawa is practicing an unusual treatment for problem drinkers. On the hour over a daily period of 12 hours they give each alcoholic a generous glass of wine. This amounts to 72 ounces or about three bottles of wine a day. The rationale for this unique treatment (run by medical personnel) is that it takes the worst alchoholics off the streets, their lives calm down, and daily police pickups, ambulance rides and emergency room visits are replaced with harm reduction and far better care. “The alternative”said one caregiver ” “is drinking themselves to death”. By giving them five ounces of wine an hour, the recipients no longer resort to drinking such harmful substances as paint thinner, mouth wash or aftershave. Once the drinking is stabilized, they then start to work on other aspects of their lives. It also emerges that only one out of 55 gives up drinking on their own. The people the Ottawa Centre deals with are those who have been on the streets drinking to unconsciousness for an average of 35 years. A medical group in Montreal would like to see the “wet” program in Ottawa established in our city. Montreal has between 3,000 and 5,000 homeless people with each one costing the taxpayers $55,000 for healh care etc. Would you like to see the Ottawa “wet” program in Montreal? It is estimated that 20 per cent of alcoholics require some kind of intervention to stop drinking. The Ottawa “wet” program targets four per cent of that group.